The Blackthorn is good. Nothing that I’m going to be adding to my top cocktails list though by any means. This drink, as Regan wisely points out, is, at its base, a twist on the Manhattan. Therein, you see, lay my main problem. The Manhattan was one of the first cocktails that I experimented with here on Cocktail Hacker and one of my first introductions to the loveliness of bourbon. I truly love a well mixed Manhattan and therefore had the bar set quite high going in. To use a bad sports metaphor, this drink placed but definitely didn’t win. Savoy Recipe: I’ll start my discussion with the classic recipe. There are two main twists to note. First, and most obviously, the Savoy recipe is made with dry vermouth. Second, and quite related, the vermouth is a full half the recipe. Of the two recipes this was my least favorite. It wasn’t bad by any means, but not something I really enjoyed. The Irish whiskey (Jameson in my case), being a bit lighter than some other whiskies, was a tad overpowered by the vermouth. In an effort to correct this issue I tried dropping the vermouth to 1 oz and upping the whiskey to 2 oz. Not a good call. I ended up dumping that variant out. Regan’s Recipe: Now we can really start making some Manhattan comparisons. The ratios are exactly the same, the bitters are the same, the only changes are the whiskey and the addition of a touch of absinthe. My thoughts on the whiskey are the same as with the Savoy recipe. The absinthe, however, adds a nice twist. First, a warning, go easy. Like bitters, you should think of the absinthe in this recipe as a cocktail spice. What I ended up doing was to add my three dashes of Angostura to the shaker tin first, eyeball the amount, then add the same amount of absinthe. This let me get the amounts as close to even as I could and if I messed up, which I did, I could dump some out and not waste the spirits. Now for a bit about the drink itself. The ratios are good in this one, so I didn’t feel the need to play with that at all. The flavor is a bit like a muted Manhattan with an extra layer of anise absinthe flavor. In fact, I really like the flavor the absinthe brings a lot. Next time I mix up a Manhattan I think I’ll give that twist a try. As for the Blackthorn, I think I’ll be leaving this one to the recipe books. This week has been jam packed and I haven’t had nearly enough time to explore this cocktail to the depth I’d like. So, rather than cutting my explorations short, I’m going to extend in to a second week and do this right. 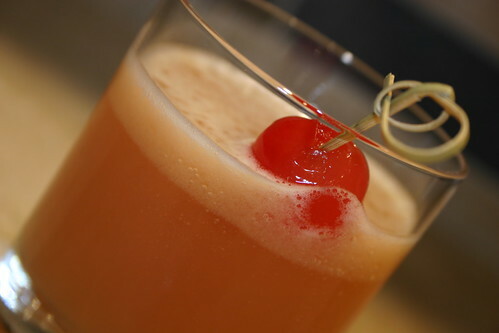 One of the angles I have yet to explore is the original recipe for the Blackthorn from The Savoy Cocktail Book. There are a couple interesting points to note about the recipe itself before I even get a chance to mix it up. First, note that this original recipe calls for dry vermouth rather than the sweet called for in Regan’s recipe. While this change will certainly alter the flavor of the cocktail quite significantly it shows a good example of how one can tweak a recipe by changing only one ingredient. Second, note that this recipe calls for the drink to be shaken despite all the ingredients being clear. As we’ve seen from previous experiments this will likely result in a colder, more diluted finished cocktail. Whether this was the intent of the original recipe’s author is hard to say as nearly every cocktail recipe in the Savoy calls for shaking. So, with that, I’m again off on the cocktail journey. Check back next week for my findings on the differences in recipes and techniques. Should be a tasty week. I’m sticking with the whiskey theme this week and mixing up the Blackthorn. Although, in looking for recipes for this drink I noticed that there are two completely different versions to choose from. 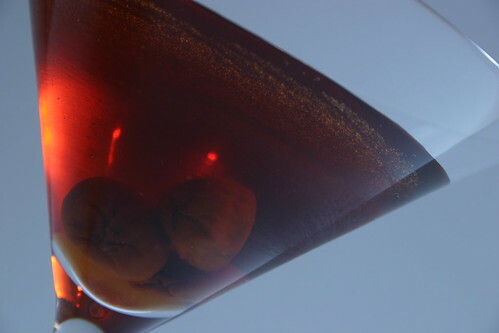 The first, and the one I’m going to mix this week, is a riff on the Manhattan combining whiskey and vermouth. The second, which I may very well need to explore at a later date, is a combo of gin, Dubonnet Rouge and kirschwasser. Intriguing. The whiskey version comes from The Savoy Cocktail Book by way of my perennial favorite The Joy of Mixology . I’m going to start with the Joy of Mixology version, but I’ll be coming back to the Savoy version as well. No, that’s not a spelling mistake. Gary Regan’s recipe adds an ‘e’ as it’s enough of a twist on the original to be a different cocktail. The title really says a lot. As I mentioned in the intro this week, this is a combination of ingredients that I never would have thought of. However, this most assuredly doesn’t mean it’s not a good one. Quite the contrary in fact. My first note for this week reads “Oh wow. Different even than I had imagined.” Different though it is, I really enjoy enjoyed The Blinker and I honestly think anyone else who loves rye whiskey will like it as well. As I sipped my first mix of this drink, I felt the recipe from Vintage Spirits and Forgotten Cocktails was pretty solid as-is. So, rather than try a host of recipes, I decided to experiment a bit with the ingredients themselves to find the combo that best suites me. Let’s start with the grapefruit juice. I picked up a bottle of white grapefruit juice since fresh fruits aren’t available for me this time of year. Bottled juice ended up working okay for this drink and I would definitely recommend you go with white grapefruit as well instead of the pink varieties. The reason being, white grapefruit juice is quite a bit less sweet than the pink variety. Any additional sweetness and I think the drink would become a bit off balance. Which brings us nicely to the other source of sweetness, the syrup. When I first read the recipe, I doubted that 1 tsp of syrup would be enough so I compensated and added about 2 tsp to my first mix. This adjustment was definitely not necessary, at least for those who like a drier cocktail. If you’re offering this drink to a friend who isn’t a die hard rye lover you might up the syrup a bit as it mellows the flavor profile a bit. For me, though, 1 tsp is perfect. Ted Haigh notes that the original recipe for this drink calls for grenadine but it’s a bit “unremarkable” using that. I gave both variations a test and liked them both. For the raspberry version I used my homemade raspberry syrup and found the drink to be quite nice. On the same note, a Blinker mixed with my homemade grenadine was also very tasty. For me the grenadine version had a bit more fruity flavor, but I think that was primarily due to the fact that my grenadine is fresher. I think either option is perfectly tasty if you have one or the other of the syrups on hand. Finally, the rye. I started where I always do with rye cocktails with Rittenhouse 100. The drink was very good but a bit tilted toward the rye flavor. In search of something more balanced without changing the recipe I tried Sazerac rye next. At 90 proof, this spirit is a bit lighter. Overall I found that this one worked a lot better in this particular application. If you only have Rittenhouse on hand then simply bump up the grapefruit juice a bit, perhaps to about 1 1/4 oz, and you’ll be all set. As a rye fanatic it’s always great to find a new cocktail to mix up. This one will definitely be added to the list of tasty libations. While it’s certainly not world changing in terms of cocktail experiences, tasty is certainly is. The holidays are over and I’m back to my regular cocktail posting schedule. I’m going to kick off the new year with The Blinker, a cocktail based on rye. Because, well, I love the stuff. My inspiration for choosing this particular came from Anvil’s list of 100 drinks to try in your lifetime. Reading the ingredients (rye, raspberry syrup and grapefruit juice) I was intrigued. This mix of ingredients is not one that I would have thought to try together. However, given that this drink was originally printed in 1934 and still survives today it must be a pretty tasty combo. So, with that, let’s get mixing.